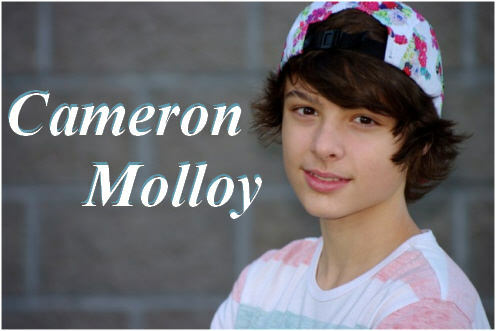 Cameron Molloy was first introduced on this site this past January in an exclusive introductory feature article. We learned much about Cameron and the beginning of his musical career in that publication. Now nearly a year later, we wanted to bring you up to date with this amazing young musical prodigy. 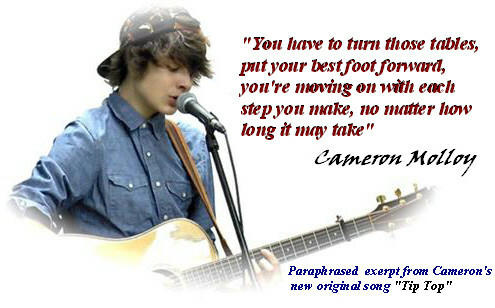 While some young artists are doing a lot of cover songs Cameron has been writing, performing, and recording his own original music. Cameron was interviewed by my good friend Bruce Owens from “Good Morning Hudson Valley” back in 2013, and that interview can still be found on this site in the Radio Interview section. Summer is typically a busy time for young artists and this summer has been no exception for Cameron! At the beginning of summer, he began vocal lessons with Rose Marie Bernaquez (who worked as a voice evaluator for Cirque de Soleil), and also continued with his guitar and music theory lessons. 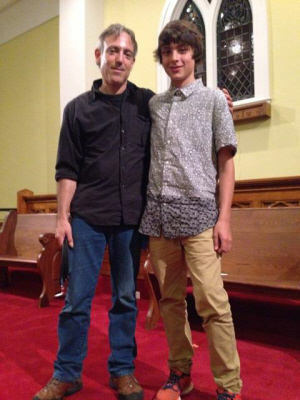 Cameron had twelve bookings at various events over the summer, highlighted with being mentored at a weeklong songwriter’s workshop by Bruce Guthro, Nathan Rogers, Kim Dunn and Chuck Brodsky. In addition, Cameron has continued his support of community fundraising for Cancer Research and other local charitable events. 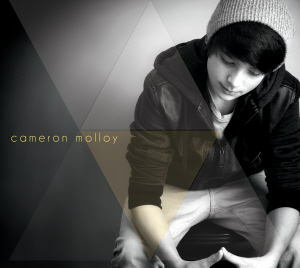 Another milestone in Cameron’s journey this year was the June release of his all original, 5 track EP. It truly was an incredible experience working with local producer Andre Leblanc and the well respected Pumpk’n Patch Studio. The result was a top shelf, radio ready ep, which has been played on Radio stations around the world and locally. His EP is available everywhere online (itunes, Amazon etc), physical copies are available at CDBaby and signed copies are available directly from Cameron upon request. You will also find a large ad on this site with exclusive clips of his songs on that EP. Social Media-wise, Cameron is approaching the 10,000 fan mark with around 80,000 views on his youtube site alone and he ranks #1 for Singer/Songwriters on the Reverbnation Chart and #2 in all Genres for Moncton NB. His fan base is steadily growing and he really appreciates all the amazing support. Something that makes Cameron special is that he takes the time to talk to his fans and keep them updated with what’s going on at every opportunity. 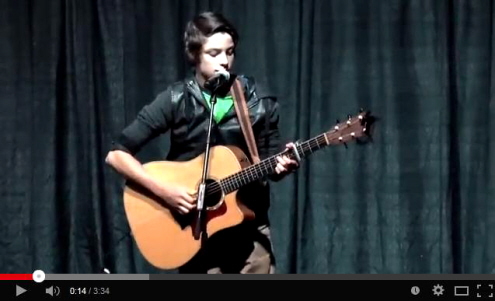 Song writing-wise, Cameron is a patient songwriter who waits for inspiration to hit him. He has written 2 songs since his last Rivenmaster Article. One of the songs called “Tip Top” is complete and part of Cameron’s current performance set list. Here is Cameron’s new song as it currently is being displayed on SoundCloud…..
“Tip top” is very much about what it takes to be successful in whatever you do. The other song is currently “untitled” and almost finished. It‘s a melodic and catchy Maritime Folk song about the Sea. Things continue to progress for Cameron. His skills as a musician and vocal artist continue to develop, his fan base increases daily, and he regularly gets opportunities to perform. These things, plus his dedication, hard work and giving back to the people who support him is what will undoubtedly make Cameron Molloy successful on his musical journey. On an exciting note…. Cameron was recently contacted about a huge opportunity which we are not yet able to share any details about. However, what we can share is that he was approached by an Atlantic Canadian Entertainment Agency for representation. 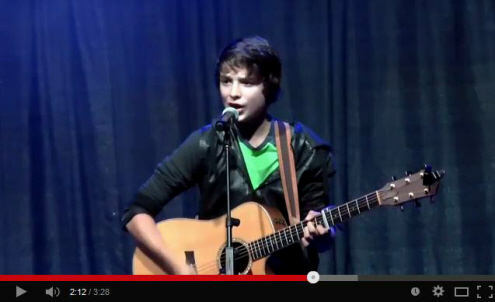 In addition to his musical pursuits, Cameron also made the Moncton Bantam Provincial AA Hockey Team, is currently Captain of his school’s volleyball team, and is in the School’s Leadership Program. While I personally have a huge collection of young artist’s music, I’m always interested in what Cameron Molloy is recording. Even though I immediately downloaded his Debut EP when it first became available, I recently obtained a signed physical copy of his new EP which I’m delighted to have in my personal collection. Cameron is one young artist who I have no doubt will be around for a long time to come and you can be sure that Rivenmaster’s Place will continue to support and promote everything this young Canadian can produce! Best of Success Cameron Molloy! Previous Previous post: Sebastián Urdiales Mexico’s Newest Young Star!